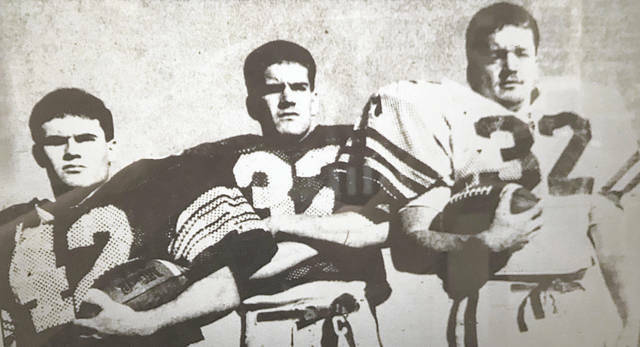 (From left) Rob Maynard, Dusty Salyers, and Shane Salyers led the Bobcats offensive attack the last time Green started off their season 3-0 in 1990. 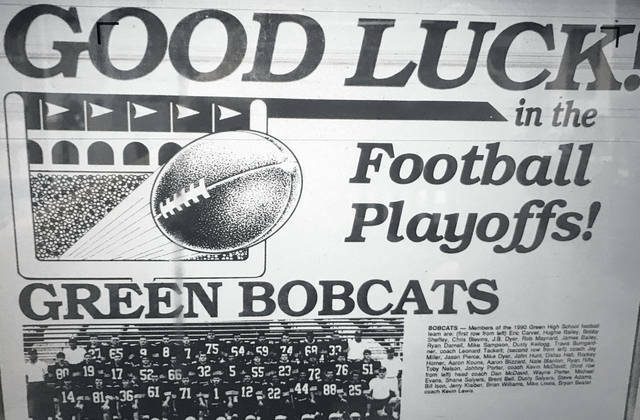 This is a feature photo on the 1990 Green Bobcats team wishing them well prior to their playoff run that season before their eventual loss to the Newark Catholic Green Wave in the Region 15 Division V championship game. Jon Bon Jovi’s “Blaze of Glory”, “Ghost” starring Patrick Swayze and Demi Moore, “Cheers”, “The Cosby Show”, and “Roseanne”. You might be wondering, what do all these things have in common? These were the most popular pop culture songs, movies, and tv shows the same week as this week, but twenty eight years ago in 1990, the last time the Green Bobcats started off a football season 3-0. The 1990 iteration of the Bobcats were coached by Danny McDavid, who is still the Bobcats baseball coach today and who is an assistant under the head football coach for the West Senators, Ben Johnson. Green finished the 1989 and 1990 seasons both with undefeated regular season records thanks to their impressive running game that featured all-state running back Rob Maynard, full back Shane Salyers, and an incredible offensive line force led by all state offensive lineman Steve Adams. The quarterback of the 1990 Bobcats? None other than Dusty Salyers, who coached the Wheelersburg LL softball team that won this year’s 2018 Little League Softball World Series and whose son, Trent Salyers, is a senior all-state quarterback for the Wheelersburg Pirates this season. The 1990 Bobcats outscored their first three opponents 97-19, which is actually considerably less that the 2018 Bobcats who have outscored their opponents 174-28 through their first three games including their incredible 86-14 victory over Hannan High School in week two. The McDavid coached Bobcats finished #1 in the Division V Region 19 rankings of that season and were ranked 7th out of all the teams in Division V in the 1990 end of season AP poll. The Bobcats were not ranked in the Division VII AP Poll after the first release following the end of week three but were ranked unofficially fourth in Region 27 of Division VII according to Joe Eitel, who is famous for using the same algorithm that the OHSAA uses in order to officially rank the teams of each region. The OHSAA official list comes out following the completion of all week four games, which will paint a clearer picture in terms of where the Bobcats stand in their pursuit of a playoff bid. At this stage in the season, even prior to conference play, the Bobcats look and feel as if they are primed to challenge for the SOC I crown this year from the defending champs, the Oak Hill Oaks. As of today, Green is the only undefeated team in the SOC I prior to conference play as county opponents Notre Dame, Northwest, and East are all winless at this stage in the season. Kickoff for this Friday night in Franklin Furnace is scheduled for 7 p.m.